Farewell, McKinsey & Hello, World! main part of this blog. away from IE looong ago! Let the Whitehead continuum be the intersection of the s.
What’s the fundamental group of the Whitehead manifold? Claim: is null-homotopic in . Since loop is compact, there is a ‘finest gap’ in the Cantor set which the loop passes through, say it’s a gap with width . 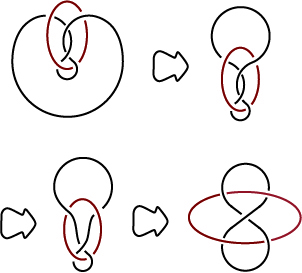 Now by performing the operation above, we can homotope all parts of the loop that goes through the to segments that goes through -gaps, by having the segments crossing themselves once. Now we pass to the -gaps, etc. until the loop lie completely outside the thickened disc which the continua lies in. Once it’s outside the disc, the loop can be contracted. 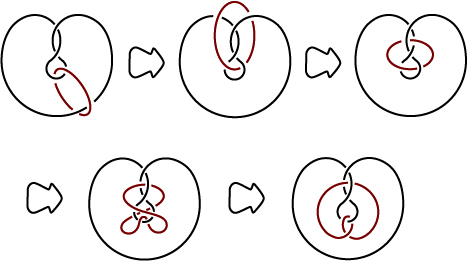 The manifold is not homeomorphic to as we can easily see that, unlike in , the red loop in picture cannot be isotoped to a trivial loop. In light of this, one may construct many different non-tame manifolds with finitely generated fundamental group by embedding a handlebody inside another copy of itself and take the complement of the infinite intersection. Here is an example of embedding a genus handlebody. The resulting manifold (after taking the complement of the intersection) is a homotopy genus handlebody. (As in the whitehead case, can be homotoped to a genus handlebody inside . The ‘third loop’ can be unknotted by crossing itself once.) But it’s of coruse not homeomorphic to the genus handlebody. This entry was posted on	November 8, 2010 at 3:13 pm	and is filed under Uncategorized.